The mission of the general physical education activity program at Cottey is to provide a variety of curricula from which the student may select to enable her to develop her cognitive knowledge of the activity, increase her psychomotor skills, improve her personal fitness and enhance her sense of value for the activity. Two physical activity credits are required as part of the Cottey core curriculum. Most physical education courses offered at Cottey will successfully transfer if the student majors in physical education, fitness, or recreation. For non -majors, most courses transfer but this may depend on the transfer school and whether or not they have a physical education department. Some four-year institutions do not require physical education for graduation but will accept physical education credits as electives. More and more colleges and universities are requiring a 2-3 credit Lifetime Fitness (Lifetime Fitness- PHE139) or Wellness class for all students instead of, or in addition to, a physical education activity class. Students should consult with their transfer institution’s academic requirement to transfer classes successfully. The physical education department offers a large variety of popular, state-of-the-art courses. Two full-time faculty offer 18 different courses in a two-year time period. In addition, the cycling and golf courses are unique course offerings in that there is no cost or minimal cost to the student who enrolls. Several of the physical education course offerings involve field trips and/or performances to experience the activity as it was intended. For example the Synchronized Swimming Class often performs a water show open to the campus community and again for parents visiting campus for graduation. In past years the Cycling Class biked 44 miles to Eldorado Springs, MO, and back. Hiking classes have tramped Pea Ridge National Military Park in Pea Ridge Arkansas, HaHa Tonka State Park at Lake of the Ozarks and Prairie State Park. Students enrolled in Jogging have one or two opportunities throughout the semester to participate in local 5K runs and Golf class visits the City of Nevada Golf Course to use its driving range and practice green. 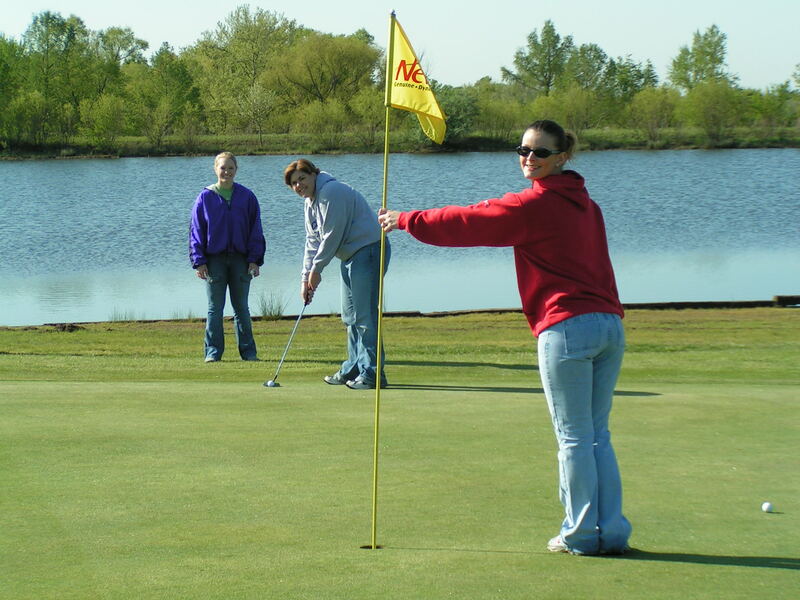 Golf students also play nine holes of golf as a culminating activity at the city golf course. The Lifeguarding Instructor course gives the student a leadership opportunity by teaching local high school students the American Red Cross Lifeguard Training Course. Many of these leadership opportunities lead to summer employment. On occasion, students showing interest and enthusiasm in physical education courses are recruited to lead intramural activities once they receive further training. Physical Education course enrollments are kept small to maximize student learning through individual feedback. Aquatic enrollments range from 8-14 students, individual sport courses typically have 12 students enrolled and fitness classes have a maximum of 21 students in a class. Students interested in a degree in Physical Education should pursue an Associate of Science degree while at Cottey. Since Cottey does not offer a Bachelor’s degree in Physical Education students should consult the catalog of the college to which they plan to transfer for specific requirements in their major. The Physical Education facilities are located in and around Hinkhouse Center. The facilities include a large gymnasium, a 25-yard swimming pool, an updated fitness center with both aerobic and weight training equipment, locker rooms, three outdoor tennis courts and an athletic field. Internship and Directed Study Opportunities- Students interested in Physical Education or related fields often need observation or volunteer hours in their field. Cottey students find appropriate experiential learning opportunities at the local YMCA, with the certified athletic trainer who works with the Cottey Comet athletes, at local schools, the community center or with the local American Red Cross. 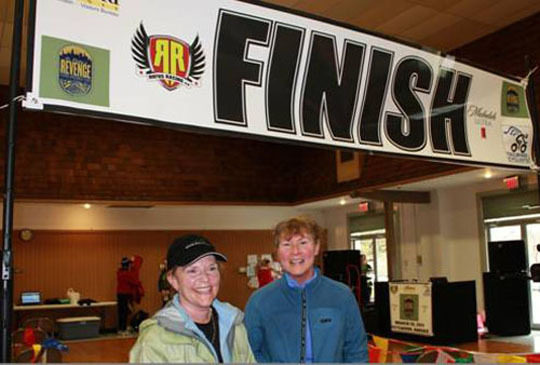 Leading Active Lives- Professors Burger and Polon encourage students to lead active lives and take their own advice by participating in local cycling, running, biathlon, triathlon and adventure racing events. The finish line of a cold and rainy biking and running event on St. Patrick’s Day! A Fitness Education Minor is designed to prepare individuals for a corporate or community based position requiring basic exercise and nutrition programming, personal training or other exercise instructor training skills. The two main factors that may increase the marketability of a Fitness Education Minor are the continuing rise in rates of obese and overweight individuals throughout the country, and that the baby boomer population is more active and is demanding opportunities to stay active. These two things in combination have created a need for educated individuals to offer exercise programming in many communities. Right now Nevada and some other small surrounding communities are finding it difficult to fill exercise instructor classes with either educated or certified individuals. This minor could provide a service to the community and help students find a job that could lead into a future career. The following is a list of courses that student’s are required to take to complete the Fitness Education Minor at Cottey College. Students are required to pass these courses with a “C” or better to earn the Fitness Education Minor. Students interested in a Fitness Education Minor are encouraged to take other recommended courses, already offered in the Cottey curriculum, to fulfill core and degree requirements to support their interests in the fitness field.